A bestseller in Italy, a beautiful, heartbreaking novel based on the true story of an Afghan boy's journey in search of safety. One night before putting him to bed, Enaiatollah's mother tells him three things: don't use drugs, don't use weapons, don't steal. The next day he wakes up to find she isn't there. They have fled their village in Ghazni to seek safety outside Afghanistan but his mother has decided to return home to her younger children. Ten-year-old Enaiatollah is left alone in Pakistan to fend for himself. In a book based on a true story, Italian novelist Fabio Geda describes Enaiatollah's remarkable five-year journey from Afghanistan to Italy where he finally managed to claim political asylum. His ordeal took him through Iran, Turkey and Greece, working on building sites in order to pay people-traffickers, and enduring the physical misery of border crossings squeezed into the false bottoms of lorries or trekking across inhospitable mountains. A series of almost implausible strokes of fortune enabled him to get to Turin, where he found help from an Italian family and met Fabio Geda. 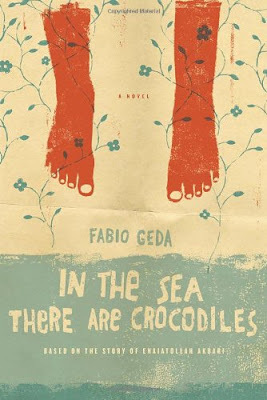 The result of their friendship is this unique book in which Enaiatollah's engaging, moving voice is brilliantly captured by Geda's subtle storytelling. In Geda's hands, Enaiatollah's journey becomes a universal story of stoicism in the face of fear, and the search for a place where life is liveable. FL Speak - If reading a memoir can be fun and moving, it was this book. Immensely loveable and beautifully written. Meet Anaiatollah. Left alone to tend form himself at an innocent age of 10, this tale takes him through hardships, experiences and various countries. Life at Pakistan was not easy for a 10 year old boy. He worked for a roof over his head with no income. 15 months later, he found another work selling items for a man. Along the way he makes friends. When Pakistan gets too hot to handle, he and his friend Sufi make their way to Iran. 3 years of working in a stone quarry and being deported again and again, Anaia decides to go to Turkey. From Turkey its Greece in an inflatable dinghy. And from Greece to Italy. The journey to Iran was a breeze despite the strict police and roadblocks. But the journey to Turkey was the most inhospitable. Led by people who told him it would take 3 days over the mountains, the journey last weeks. Along the way, others in the group lost their lives but Anaiatollah has learnt one very important lesson. Don't get attached to people. But after that horrendous trek, when you have to crawl in a tiny space with tens of people for 3 days on a false bottom of a truck without stopping even once, you know you'll have to make your resolve harder than steel. When jobs stopped trickling down the labour market, Anaia and a few of his new-formed friends decide to go to Greece. In an inflatable dinghy. What was supposed to be a 3 hours of rowing took more than a day and one lost-at-sea friend. But luck was about to change for Anai. Greece promised a new ray of hope for a 15 (?) year old boy. With the Greece Olympics around the corner, job was easy to find at a good wage. But settling down was never easy, specially when jobs came harder to find again. Italy beckoned our young adventurer a few months later and a few help from strangers allowed Anaia to find his way to Venice. From Venice to Rome to Turin where he met another old friend from his hometown who was living there. I started this book in the evening and finished it in 2 hours. Its engrossing, simple and straight out of the heart. There was never a dull moment. Every page keeps the reader for more, every page cries out for help, every page a delight inspite of the boor boy's plight. This true story of Anaiatollah will move you, will attach itself to your heart and not let go. How a 10-year old accomplished all this, its mind-boggling. Parents will never want their kids to face such an ordeal. I feel immense sadness for his mother for leaving him alone. But what choice did the poor woman have? She gave him a chance. A chance that the Taliban in Afghanishtan would've snuffed out forever. Keeping true to the three promises to his mother, Anaiatollah's tale is full of bravery, determination to survive and an indomitable resilience. How the story ends, you'll either need to meet the person himself or read this. I sincerely hope you do the second and pray that you chance upon the first. For someone like me who hates memoirs, this was a wake-up call indeed. How can it be fiction if it's a memoir?? Read "not without my daughter" . thats one of the best tale i read about a journey for freedom ! As for this , I will sure put this in wishlist ..